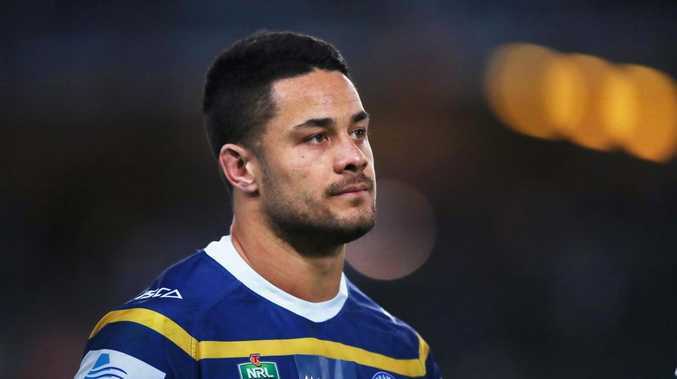 The Eels have a big call on Jarryd Hayne in the near future. 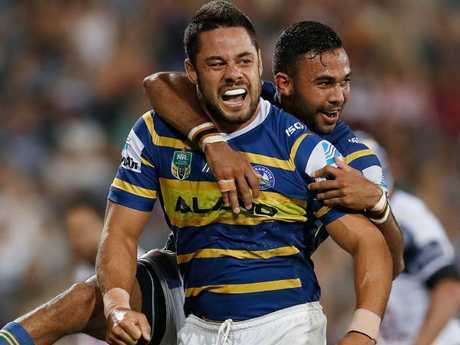 MATTHEW Johns has called for some big changes for Parramatta during the off-season, including an all important call on Jarryd Hayne. Fans have been frustrated as the club's prodigal son hasn't lived up to expectations after signing with the Eels for 2018. But a rich vein of recent form has seen Hayne's stocks rise in the past few weeks as he looks for a new contract but Johns has urged caution. "The signs in the last month have been positive, he's found his role," Johns said on Wednesday. "They've started to get some really good football out of him by saying play on the wing, but it's a roaming role just pop up where you need to be. "The other night you saw that, he popped up in the middle of the field, goes straight through and scores. "There's no doubt about Parramatta, they need to turnover a fair few on this roster. They need to evaluate their roster and no doubt Jarryd will come into that." The Hayne Plane has taken off in the last couple of weeks with glimpses of his past form. It has been a tough season for Hayne, who revealed he had been battling a debilitating stomach problem he believes he picked up after drinking local water while training with the Fijian Rugby Sevens team. He was diagnosed with H-Pylori while playing on the Gold Coast, leaving him bloated and requiring surgery as the disease attacked his stomach lining as his immune system suffered and he struggled to digest food. Injuries have also derailed his season with a recurring hip flexor injury keeping him off the field in the early rounds. Johns was asked if Hayne still had the desire to play rugby league or would be better going to union. "There have been a lot of questions about his hunger this year but he has had injuries," John said. 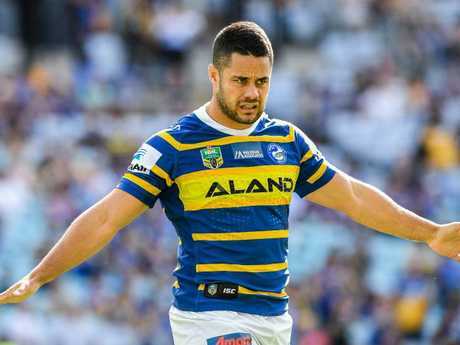 Hayne has scored five tries in 10 games for the Eels in 2018. "Once he's had a bit of consistent football, he's started to look pretty good. Whether that's enough for Parramatta to say 'yep, we're going to go again', I don't know." "Parramatta have a bit of a conundrum to know what to do because it'd break their hearts if all of a sudden they say it's not worth it, he goes somewhere else for $250,000 and suddenly just goes pop. "There's no doubt with Jarryd that when you least expect it, sometimes he just produces." It's been a horror season for the Eels in 2018. 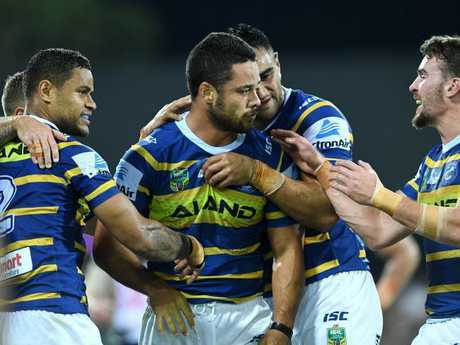 Thought to be one of the frontrunners before the start of the season after a top-four finish in 2017, Parramatta have been anchored bottom of the NRL ladder for a majority of the season. Matthew Johns suggests there will be a big turnover of players from the current squad. Johns said there were some things the Eels need to look at going forward. "They need an injection of youth, particularly into that forward pack. They have some good juniors coming through," Johns said. "The other thing they have to do is they've got to re-evaluate how they play. "I made this point before, what really interests me about the Storm versus South is the fact that (Souths coach Anthony) Seibold has watched the Melbourne Storm from afar and recognised how they won the competition last year. "What he did with South Sydney was, if it was a house, he demolished it and rebuilt it and they've come back with a new style of football. "They have players playing a lot different, they're playing a much freer role based off the Melbourne Storm and how they won it last year. "Parramatta haven't adjusted to that. They're still trying to play their 2017 style, a lot of structure, a lot of set-up plays and that suits the defence. I think they're falling a little behind there."